A bilge pump is essence is a water pump used to remove bilge water and is usually located below the waterline. It uses a desired pressure to direct water through an intake valve and then through the outlet barge where it leaves the boat. The best bilge pump is the Shoreline Marine, which is compact and powerful with a GPH rating of 600 and that is very impressive considering the low cost of the device. There are a range of bilge pumps from electric, manual, automatic/manual electric, priming and an installed bilge pump. Every bilge pump will have a GPH rating that determines how many gallons it can remove per hour. Many people will upgrade to a top bilge pump that has a higher GPH and is larger in terms of the output hose. When buying a second hand boat, its impossible to tell the age or health of the bilge pump and for peace of mind, its always worth replacing. Bilge pumps are often overlooked by many boat owners until the point when they are sinking or the boat is flooding. You will need to ensure you have a bilge pump large enough for your boat and if your boat is over 16 foot, we recommend 2 bilge pumps. Bilge pumps are not that hard to install to your boat and they are relatively cheap to buy, which makes it silly not having a spare. Below is a list of the best bilge pumps for your boat to ensure you stay afloat and water does not build up on deck. The Shoreline Marine brand is highly reputable with regards to boating equipment and their bilge pump is a very popular choice. This is because of the compact design, with 3/4 inch output hose and a choice of 600, 800 and 1100 GPH. The pump is fully submersible in water and uses marine grade wiring for optimal performance is damp environments. Installing this bilge pump is fairly simple with a mounting base and stainless steel hardware. The Shoreline Marine bilge pump is a manual electric pump, therefore before you go out to sea, remember to turn it on! Overall, it is by far the best bilge pump for your boat with excellent GPH, small construction and excellent value for money. The popular bilge pump among boat owners is developed by SeaFlo that has a flow rate of 750 GPH and an output hose of 3/4 inch. These are similar to specifications to the Shoreline Marine but the SeaFlo has the edge when it comes to the cheaper price. A unique feature to the SeaFlo is the testing button at the rear of the bilge pump to ensure its working correctly. It can be a direct replacement to your older automatic electric bilge pump and will connect straight on. It will only power up once the sensor is triggered by the water level. It uses 12V power and there is an ignition protection for brief high electric current and it won’t burn out when run dry. SeaFlo has focused on producing a reliable bilge pump and with properties such as rustproof and corrosion resistant components such as stainless steel shafts, durable plastic housing and more. Overall it is one of the best cheap bilge pumps for the money with the Shoreline Marine being slightly better with different choices of GPH. The most powerful bilge pump is the Rule 2000, which the name gives away the GPH, which is of course 2000. It is a genuine Rule boating product that comes with a 3 year warranty and multiple choices of voltage (12, 24 and 32). It uses a 1-1/8 inch hose barb discharge outlet and has more pumping capacity than any other bilge pump according to Rule themselves. 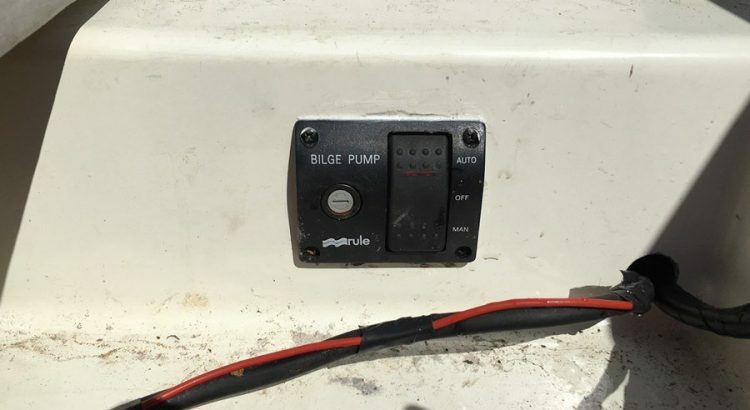 On the topic of other powerful bilge pump competitors, this Rule 2000 can run dry without burning up and is half the size of other powerful units. The smaller design also means its that much easier to install. Overall, if you have a large boat, this is the best powerful bilge pump with a huge 2000 gallons per hour that will ensure the bilge is kept dry. There is even a more powerful version of this with the Rule4000 GPH, however 9 times out of 10, the average boat owner will not need that amount of power. The Attwood alternative uses a double filter base that resists clogging and offers a powerful 1200 GPH. It is a manual pump rated at 12 volts and uses a 1-1/8 inches barbed outlet to draw water out of the bilge. If you are someone who likes to repair rather than replace, the Attwood model uses interchangeable motor cores and replacement cartilages. This means servicing your pump is much easier than any other alternative. Overall it is a top rated bilge pump and great to maintain over time than constantly replacing every year or so. If you do not need the power but what to stick with the unit, they also offer two less powerful models that are 500 and 800 GPH. If you are looking for a cheap bilge pump that offers high power, the 1100 GPH Maxzone automatic pump is a good option. Even for use as a backup to your more powerful bilge pump, it is cheap enough and offers all the features you would expect. With an outlet diameter of 3/4-Inch and 1100 GPH, water will be flying out of the bilge like a hose pipe. Considering the low cost of this pump, it really is excellent value for the money. There is a built-in float switch and the unit does not use any power until the internal float switch is triggered by the water level. It uses an electronically controlled reed sensor for the automatic operation. Overall, considering the very reasonable price and performance statistics, it is a great cheap bilge pump for your boat that will reliably keep water levels in the bilge to a minimum. In terms of the definition of a bilge pump, it is basically a water pump that is used to remove bilge water that has collecting within your boat. An automatic bilge pump in particular is the most desirable as it will ensure that the bilge water doesn’t exceed a certain limit. After all, you will not be with your boat all the time in order to monitor the situation. The bilge pump is an essential component of the boat and there are many factors to consider before purchasing the first pump you find. Electric or Manual. Pumps that run from the boats electric with a switch of a button or manual that require use of a hand pump to remove the water. Electric Automatic. Automatic bilge pumps senses when the water is at a level where it needs to be removed and then activates the pump. Choosing between the two is up to the personal preference of the boat owner. Many automatic pumps will have a manual override option with a float switch or you can either wire one in yourself. Using a bilge pump is the best method of ensuring that bilge water doesn’t build up. However, lets say the automatic bilge pump stopped working or became disconnected from the battery of the boat. The water capacity will begin to increase in the bilge and this will become a problem if not fixed. 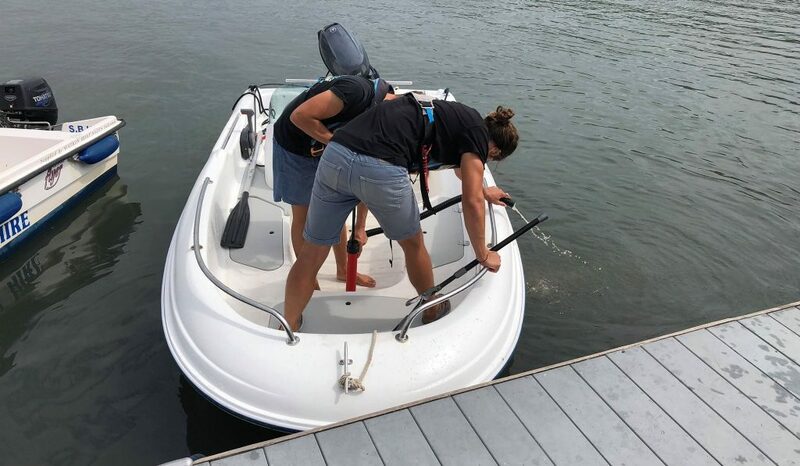 If you want to be removing water from the boat (as shown below) each time you arrive at the boat, then we highly recommend fixing your bilge pump! One way to counter this issue and increase the life span of your bilge pump is to invest into a boat cover for your particular boat. This will ensure that water cannot access the inside of your bilge and the pump will not need to run. With technological advances, bilge pumps have become smaller and more powerful with much higher GPH ratings. GPH stands for Gallons Per Hour, with the rating being the number of gallons of water it can remove from the bilge. The pumping capacity of your pump matters and if you have a boat that is over 16 foot, you should be investing in a powerful pump or multiple pumps to combine the GPH. BoatUS have written a great guide to help you choose the capacity. Just because a bilge pump states it may remove 1000 gallons of water per hour, do not stand by this. It is more likely to remove half of that because there are other variables such as vertical distance, voltage conditions and other scenarios. If you ask boat owners for large vessels, you will more than likely be told they have two bilge pumps to ensure water is removed as quickly as possible if it reaches a certain level. For small inflatable boats, a bilge pump is not necessarily required. However, if you have an outboard boat engine with a inflatable rib, you will require one. When it comes to installing or replacing your current bilge pump, it will require some form of electrical knowledge. An automatic bilge pump will require a harder installation but no more complex than the standard electric alternative as both will require a marine panel switch and power from the battery. The switch panel can be installed pretty much anywhere that is accessible on the boat but the pump itself needs to be in the bilge (of course). If you are not that confident installing an electric bilge pump, the manual alternative will need no wiring and may be the best option to choose. View Lake Expo’s tutorial on how to install a bilge pump on your boat. This may give you some confidence to do it yourself. The bilge pump for your boat is an essential device that ensures water does not build up. Many boat owners underestimate how much rainfall there can be overnight or how much water actually enters the bilge. This can cause problems if the water is not removed from inside the bilge and boat. When it comes to purchasing the bilge pump, ensure that you match the capacity to the boat size. You can even install multiple bilge pumps, which many boat owners will do to remove water from the bilge. All of our recommendations in this article are top rated and are suitable for a range of different boats.